CSB-850 BM - CSB Sliding Bearings India Pvt. 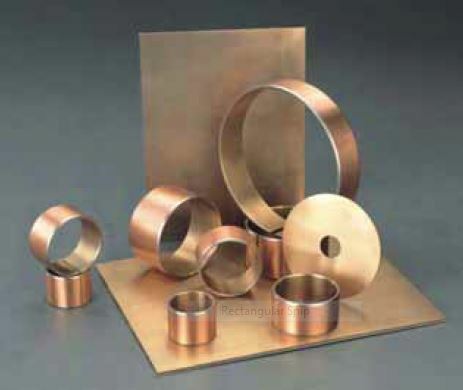 Ltd.
CSB-850BM metal backed bronze with graphite lined bearing materials, sintered layers are of special copper alloy containing uniformly dispersed solid lubricants. The solid lubricant will be released at the bearing surface as wear occurs. To aid the running-in process, a thin film of solid lubricant can be applied to the bearing surface. This will be ensure a consistently low coefficient of friction with total freedom from stick-slip, even from initial assembly. The inner side can be machined after the parts fixed to get high tolerance. 1.Sinter bronze powder with graphite: good wear resistance with lower friction and excellent load carrying capacity. Can be machined after fitting to get precision tolerance. CSB also can supply the bearings with PTFE or graphite sprayed layer on the work surface to get much power start friction. 3.Copper plating 0.002 mm, good corrosion resistance. CSB850BM bearings with running-in film are pre-finished and should not e machined. In the event of damage during assembly, the spray material can be available for on-site repair. The standard CSB850BM bearings can be manufactured, these material supplied without a running-in film, can be applied after final machining. The machined layer can not be exceed the sintered layer.